Walk-behind mowers can pack the same amount of power as their larger counterparts, as proven by the John Deere WG32A. This commercial walk-behind mower comes with a seven-gauge fabricated fixed mower deck, a five-speed gearbox, and a powerful engine. Let’s take a look at some of the highlights of this mower and what makes it rise above the rest. 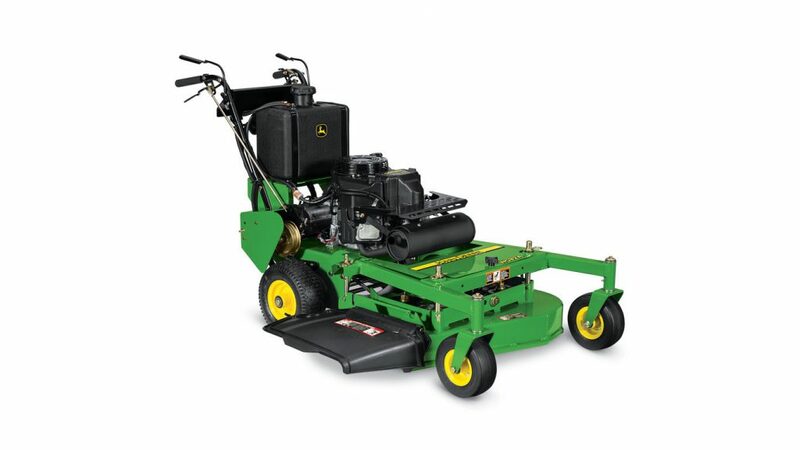 The John Deere WG32A comes with a 14.5-horsepower air-cooled, vertical-shaft engine. It is designed to efficiently use its fuel and consume less oil. In addition, it has a V-twin engine design and full-pressure lubrication, meaning less wear and tear on its parts over time. Aluminum block engines effectively dissipate heat and extend overall lifespan. The pistol-grip controls of this mower are comfortably within reach of the operator. There are a separate choke and throttle, which take the guesswork out of choke operation. Color-coded and marked switches and buttons simplify overall operation. The John Deere WG32A has five forward speeds and one reverse speed. While driving forward, it can move up to 5.4 miles per hour; when in reverse mode, it operators up to 2.7 miles per hour. A mechanical lever can be easily engaged to trigger the brake. This mower has a seven-gauge, 0.179-inch, floating fabricated deck that provides a high-quality cut in a wide range of conditions. The high blade-tip speed of 18,000 fpm means more blade strikes per inch mowed. With a wide, raised discharge chute, there is more even clipping distribution. Operators can also easily adjust the height of the cut as they work. This machine comes with a 5.8-gallon (U.S.) fuel tank with a pulse fuel pump. It is delivered through a carburetor, and it comes with an easy-to-use shut-off valve. The John Deere WG32A has a five-speed, gear-drive system with reverse. This means operators can make ground-speed adjustments as necessary to meet their mowing application needs. It also allows for easy-smooth shifting, and all shifting can be done on the go. The flat-free front caster wheels of this mower reduce downtime, meaning more productivity on the job. The wheels are made of a durable rubber and have a wide profile. Overall, operators enjoy a smoother cut and easy maneuverability. If you have any questions about the John Deere WG32A or other mowers, contact your local John Deere dealer.